I love baking with fruits and nuts. It gives a very distinct colour and flavour to cakes and other baked goodies. For instance this Pistachio cake with orange zest. The nuttiness of pistachios with the aroma and the kick of the orange zest is mesmerising. 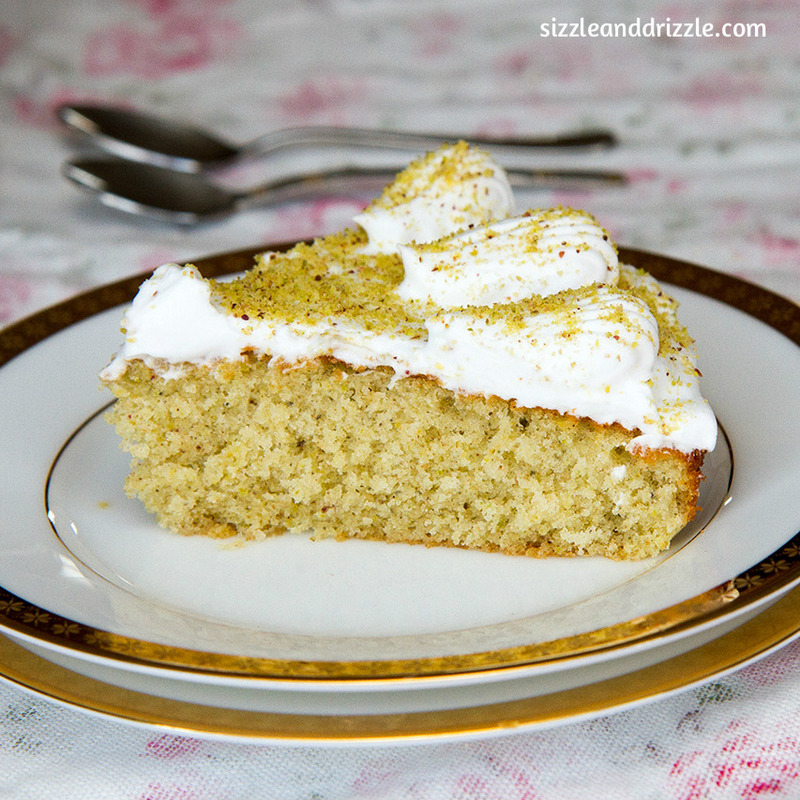 A little bit of cardamom powder and a hint of cloves intensify the pistachio taste in the cake. I baked this cake and sent it to my friend as a birthday gift, some 350 kms away by courier. And it stayed moist and delicious for 2 days and survived the travel well. Of course there was no frosting, it was a beautiful and delicious naked cake. Heat 1 tablespoon water and immerse 2-3 cloves in it. Keep it aside for 5-10 minutes till the cloves let out the aroma into the water. Pulse pistachios in a mixer and sieve it to remove any clumps. Pulse the clumps with a little bit of powdered sugar to avoid the pistachios from becoming oily. Mix flour, baking powder and cardamom powder in a bowl. Add pistachio powder to it and mix well. In another bowl – cream butter and sugar till light and pale. Add eggs one at a time and incorporate well. Discard the cloves and add the water to the egg mixture. Add vanilla and stir. Add the orange zest and whisk. Now alternately add the milk and dry ingredients to the egg mixture and fold in well, till there are no lumps of flour. Line a 8/9 inch round baking pan with parchment paper at the bottom and butter the sides. Pour the batter into the prepared pan and bake in the preheated oven for 30-40 minutes till a skewer inseted in the centre comes out clean. Let it cool in the pan for 5 minutes before turning it over on a wire rack. Meanwhile, beat the whipping cream till it forms soft peaks. Add powdered sugar and whisk till stiff peaks are formed. 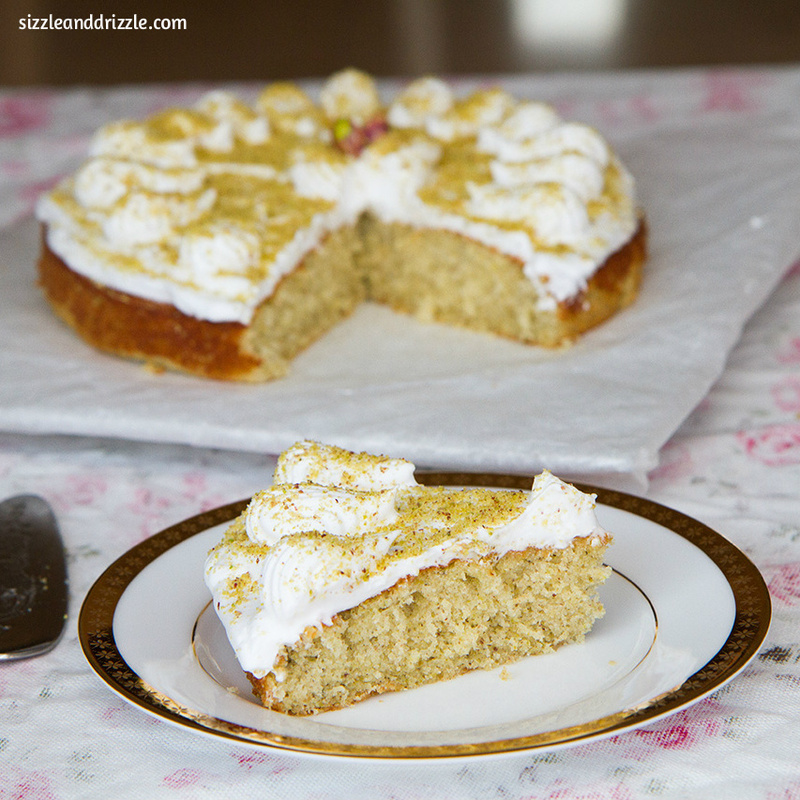 Once the cake is cooled completely, spread it with the whipped cream and drizzle with some powdered pistachios. This cake without the frosting stays well at room temperature for 2-3 days. If you want a bigger cake, this recipe can be easily doubled and made into a stacked layer cake. You can omit the clove water and replace it with some rum.